Flipkart promises to offer discount upto 90% on all of its products and we might even be able to see some come cool products priced at Re. 1 from Flipkart. 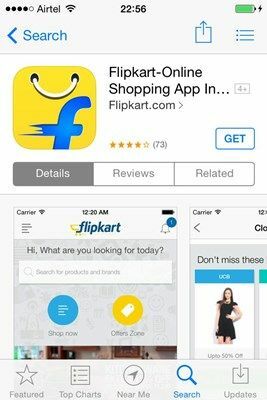 So after its big and nasty Big Billion Day and 1st Edition of Big App Shopping Days (8-12 December, 2014), Flipkart.com has now announced its second edition of Big App Shopping Days which provides Special Discounts Only on the Flipkart App from 23rd – 25 March, 2015. This is probably going to be the biggest ever sale by Flipkart or any other Shopping Portal or events like Great Online Shopping Festival (GOSF) till date. Flipkart promises to offer discount upto 90% on all of its products and we might even be able to see some come cool products priced at Re. 1 from Flipkart. Although the catch here is you can avail these discounts only if you shop through the app. You won’t be able to avail the discounts if you’re from desktop or even if you’re accessing Flipkart through your smartphone browser. You seriously need to download the app and purchase from it to avail these huge discounts. Flipkart has become a dynasty in the Indian ecommerce scene and alone itself is a strong contender among various other online stores like Snapdeal, Amazon, Infibeam, Shopclues and 450+ other stores. 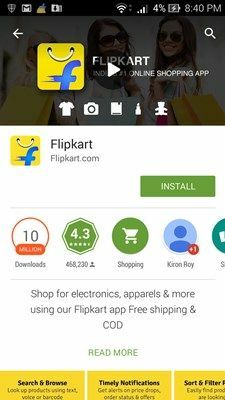 Flipkart on its Big App Shopping Days which starts on 23rd March, 2015 and ends on 25th March, 2015 claims to offer huge deal across all of its products category. I do believe that Flipkart will be able to handle this shopping festival effectively as it had burned hands during its Big Billion Day & Big App Shopping Days (1st Edition) and might have learned lessons from it. Why is Flipkart Big App Shopping Day available only through the App? If you have this question, then I’ve got a definitive answer for you. According to this report, in India there are 349 Million Mobile Users, which boils down to 19% of the Population uses Mobile. Over 250 Million People in India has access to Internet and out of the above 349 Million Mobile Users, 70% of them have access to Internet. In India most people have mobiles rather than desktop and laptop computer, so this made real sense for the company to keep the Big App Shopping Days through mobile and only through its App. This in turn will increase the number of Flipkart Mobile App Users, since an App has an ability to send notifications; Flipkart is going to use this and alert users about future discounts days and launch of new products. It is very easy to convert people via an app rather than a mobile browser, Desktop Computer or via Email Marketing. Through notifications a user has only two options either to see the discounts or clear the notification. For All Users – Visit Flipkart and enter your Mobile Number to Download the App. If you own Blackberry smartphone with BB10 OS, then you can download Flipkart app by side loading it. Download from here. We till now know that there will be 90% Discounts, 70% Discount, 50% Discounts and some more slots of discounts on all of its categories. Via the Flipkart App you can get FREE VOUCHERS worth Rs. 100 on Big App Shopping Days via BookMyShow. 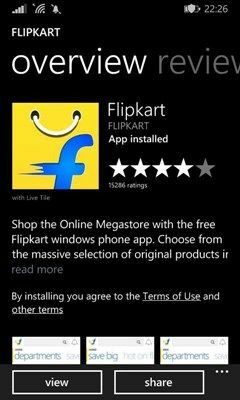 * Install the Flipkart App on your Android, iPhone or Windows Device. * Log into the app using your credentials like email id and password. You can even login via Facebook and Twitter. * Within 24 hours you’ll be notified of FREE Rs. 100 BookMyShow Voucher. IMPORTANT: The voucher is available only for First Time App Installs. We expect to see huge discounts Men and Women Clothing, Mobiles, Mobile Accessories, Camera, Camera Accessories, Laptops, Laptops Accessories, Men and Women Footwear, Sunglasses, Watches, Smartwatches, ACs, Air Cooler, Washing Machines, Bags, Belts, Wallets, Grooming and Wellness products, Books, Ebooks, Movies and TV Shows, Gaming, Music, Kitchen and Dining, Home furnishing, House Keeping and Laundry, Wedding Products, Sports and Fitness and 100 more product categories. The Flipkart Big App Shopping Days will start at 00:00 Hours (12AM) on 23rd March, 2015 and end on 23:59 Hours (11.59PM) 25th March, 2015. CLICK HERE to see all the exciting offers on the app. We hope you find the best deals on the Flipkart App Shopping Days and you get the products you want to buy. Hope the app doesn’t crashes and Flipkart is ready with backup to avoid the dirt they have put over them on the Big Billion Day. We really have high expectation from the event and just expect the best. Wow… i am very much exited about this flipkart app sale.. hope this time flipkart will give some gr8 offers..
Flipkart has said to have taken lot of care for the big billion days’s sale 2015, in order to give the best ever and hassle free shopping experience to its customers. So download the app and enjoy shopping.